Words can’t explain how I feel this morning as we sit here in Coronado at the Team Beachbody annual Leadership Retreat. Brigitte Linford lived in our small town of Idaho Falls and we had some mutual friends. She was seeing these things on Facebook about us making payments toward paying off our home with our earnings from Team Beachbody and she was intrigued. The thing was, she didn’t want to be known as a stalker so she never liked any of my posts, she never commented, and she never sent a friend request or a message but every day she came to my Facebook page to see what I was doing. 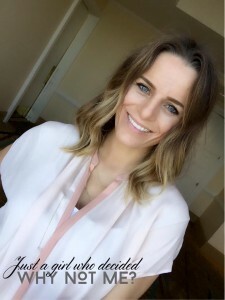 She was into running and was at a plateau so she went online and bought Shakeology without talking to me and had great results together with her husband Jayson Linford. I remember the day like it was yesterday. I was still working my full-time job back in April of 2012 and as I walked out to lunch I saw a message in my inbox from Brigitte expelling what she had been doing the past 3 months and that she could do what I was doing. Here is the end of the message. “My husband has started taking these shakes everyday as well and is losing weight (15 lbs so far! He isn’t doing any workout schedule either so that’s pretty good for just taking the shakes!) and we both absolutely love the shakes. Well last month we ran out of the powder 2 wks early since he was using it everyday as well, so I need to be ordering two bags a month. That’s when I decided I should just be a coach because it will save me money I think. 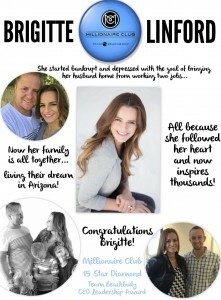 There are a couple things that I feel inclined to share about Brigitte as she enters the Beachbody Millionaire Club. She cares DEEPLY about her coaches and their success. She works INCREDIBLY hard and is self-driven. I remember going over to her house a couple days after she signed up as a coach in April of 2012 and we did what is called a GSR or Getting Started Right. She was armed with a million questions and we went through them all. This was a scary time in my life as well as I was contemplating walking away from my full-time job. I expressed to her that I was afraid to leave the job and the security and this is what she said to me, “Scottie if you carry with you the energy I felt when you walked into our home tonight with you every day, you will attract whatever you need into your life to help you achieve the goals you need and want.” In that moment as a brand new coach, she coached me. It was honestly that moment that I knew Brigitte would be an amazing coach and not just a coach to get a discount on the “shakes”.To help you all be inspired by Brigitte and know that your past does not define your future, she comes from a long life of depression and thoughts of suicide in her youth. She has learned and is continuing to learn that by being vulnerable about who she is and sharing openly about her fears, goals, and dreams she has attracted in people just like her and build an amazing business to the highest rank of Beachbody of 15 Star Diamond. 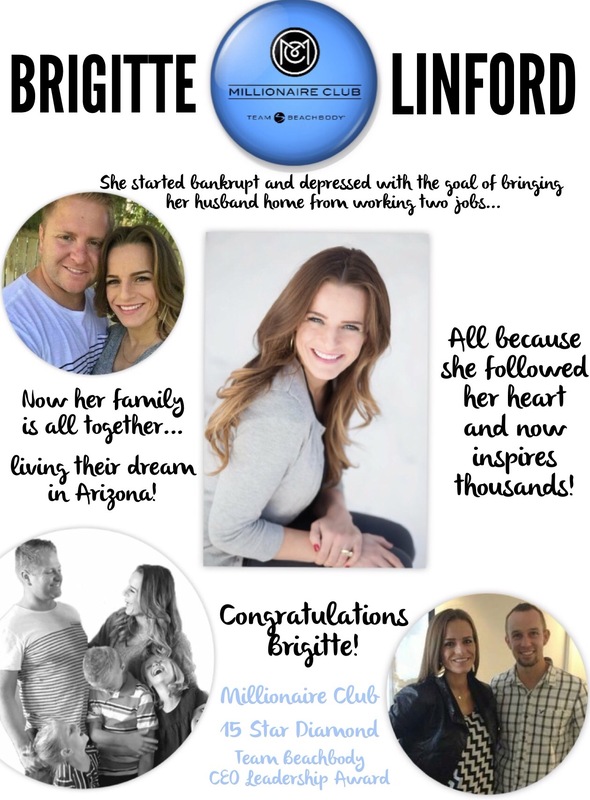 Brigitte was also awarded in 2014 as the CEO Leadership Award earner in the entire company. She is the definition of a true leader who cares deeply about the success of others. We have watched her go from bankruptcy, including at times returning things such as light bulbs and other items to the store in order to buy food for her family to now helping her husband retire from the 2 full-time jobs that he was working before. Once they became a full-time family, they moved out of the cold Idaho winters down to Arizona where they are living the life of their dreams. Her husband Jayson was able to go to a service trip in Ghana this past month to love and serve the people there. We are incredibly proud to announce you as the our first Team Beachbody millionaire and want to let you know that we love you and your family for being so open about your lives and helping so many people across the world. If you have been touched by Brigitte or her team in some way like we certainly have. Lets show her our love and appreciation!! “I knew this day was coming. And still, it feels so surreal. I couldn’t sleep last night. As I laid in bed last night my mind was RACING with memories. Scrolling through my mind like old familiar reruns. Memories of people telling me I was wasting my time with Beachbody, that this would never work out. Memories of people making fun of me. Memories of hard times, failure…… Lots of failure. Memories of missed goals and disappointments. Memories of financial struggle…. Creditors calling, a car repossessed, losing our dream home in foreclosure, credit card debt, going TWO YEARS without income and ultimately filing bankruptcy. Memories of barely scrapping by, counting every single dollar to ensure I had enough money to buy groceries. It’s so hard to talk about money, so I just haven’t. It’s such a touchy subject! I haven’t shared my weekly income or shown any sort of detailed income progression publicly on my Facebook page for over two years. But quite honestly, I wouldn’t even KNOW about coaching if someone else hadn’t been BRAVE in talking about money. That’s how I met my coach! I saw a random post on Facebook from someone I didn’t even know as he shared how the extra money he was making from BB was going towards paying down his mortgage. I was intrigued to know how someone had an extra 5 grand each month to put towards their mortgage – it blew my mind cuz we were living off 4 thousand a month! I started following this stranger and he inspired me to start P90X & Shakeology. How forever grateful I am for this stranger, Scottie Hobbs, for being BRAVE and sharing that post. So I’m being brave too. And I pray this can inspire someone, at least one person. I pray I can give at least one person the same HOPE I developed by seeing someone else succeed! So here’s the thing……. As of today I am officially the newest member of the Millionaire Club. Almost 42 months ago I signed up as a Beachbody coach. It took me 9 months to make a cumulative ten thousand dollars. Which is not too impressive considering the TIME and EFFORT I put in. I think I was earning like ten cents per hour? Ha! But the income has grown, multiplied, and now…… my coach account has earned a cumulative amount in excess of a million dollars. The EVEN MORE surreal thing for me lately? When I add in the weekly income from Jayson’s account with my account – together we earn an average of $19,400 weekly. With 52 weeks a year…… this is literally a million dollar a year business, even without the quarterly bonuses. Words fail me as I try to capture the emotions of my heart. From the first day of coaching I’ve had one particular scripture written on my office white board. “With God all things are possible”. It sounds so cliche, but what else can I say but —> IF I CAN DO THIS ANYONE CAN. Current circumstances do NOT determine future possibilities.